Itkis advises him on everything from politics to girlfriends to careers. She tells him to make the most of his Harvard education, though she doesn’t think much of Harvard doctors. She talks about the fulfillment found in public service. One week, though, she mentioned something Christ really took to heart. She said there were a lot of people with Alzheimer’s disease on her floor who could really use someone to talk to. 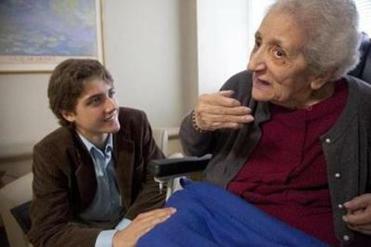 Christ is the founder of Harvard’s new Alzheimer’s Buddies program, a collaboration with Hebrew Rehabilitation Center in Boston that pairs residents with Alzheimer’s and Harvard student volunteers. The students visit their buddies every Sunday, keep journals about their experiences, and get to know their families. Ryan Christ regularly visits Sofia Itkis on Sundays in the nursing home. He says the 85-year-old woman is his mentor. Though it’s hardly the only intergenerational program for dementia patients, it’s unusual in at least one way: Buddies are paired up according to their shared interests, which in many cases seems to facilitate a strong, exceptional bond. Musical buddies sing together, others dance together, read poetry, chat about cars, watch movies, or in the case of Christ and Itkis, talk science together. Lauren Gabriel and her 98-year-old “buddy,’’ Bob Masters. “It’s unbelievable to see the effect it has on the residents,” said Robin Stewart, the facility’s life enhancement leader. Christ, who grew up in Delaware, has had a lot of experience with neurological diseases. His great-aunt Stella had Alzheimer’s. She lived with his family when he was in middle school, and Christ helped his parents take care of her. One of his grandmothers had multiple sclerosis and spent years in a nursing home; he watched his grandfather visit her every day for a decade. More recently his other grandfather, whom Christ “look[s] up to as an idol,” was found to have dementia. 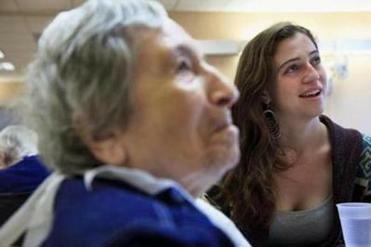 Harvard University student Brenna Hilferty watches TV with her “buddy,” Edith Sarah, 91, at the Hebrew SeniorLife center in Roslindale. Other college students might just have filed this tidy insight away, but not this student. “I thought, wow, this is so neat. Other people need to be aware of it,” said Christ, an endlessly energetic 20-year-old who also studies the genetics of Alzheimer’s research at Harvard Medical School, and spent last summer in Tanzania helping teach nurses how to set up electronic health records databases. When he arrived at Harvard, he got the idea of starting a program that would bring students together with people with Alzheimer’s disease. Staff at the Hebrew Rehabilitation Center agreed to sponsor it. It’s supervised by Jeffrey Robbins, a social worker in the neurology department of Brigham and Women’s Hospital. Years ago, Robbins helped start a program that matched high school students with nursing home residents with Alzheimer’s. The program was named for his mother, who had the disease. Christ decided to use the same model for Harvard students, recruiting them last fall by posting notices online and in every freshman entryway at Harvard Yard — “and there are a good 80 entryways here,” he emphasized. The program has just wrapped up its first year, with 24 students, all of whom are trained by professionals specializing in dementia. On April 22, the last visiting day of the semester the students gathered in the lobby of the Hebrew Rehabilitation Center, then fanned out to visit their buddies. 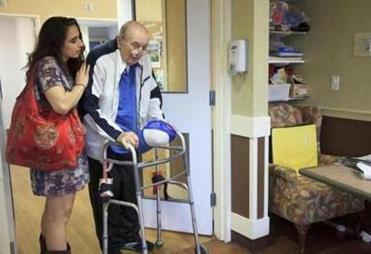 Sophomore Lauren Gabriel, a Harvard cheerleader, was visiting 98-year-old Bob Masters, whom she described as “the best thing ever.” She said she recently confided in him that she was nervous about interviewing for jobs, and he gave her great advice. They met in a common room and Masters’s face lit up when he saw her. “Well, I’m so glad you’re here,” said Masters, adding his son hadn’t come in a month. Not every buddies’ visit was as lively. Brenna Hilferty was visiting 91-year-old Edith Sarah in a special care unit for people with moderate to severe dementia. They watched a movie together. Tunc Kiymaz reported that his 94-year-old buddy seemed too tired for much conversation. Ryan Christ’s buddy Itkis — she calls him her “Harvard boyfriend” — was in fine form. She was sitting under a blanket in a wheelchair. The conversation centered, as it often does, on her former life in the Soviet Union. She lived in Odessa, which, as it turns out, was where Christ’s great-grandmother was born. Christ asks her about the time she spent in Kazakhstan as a public-health worker. She tells him, as she does every week, about how she provided milk and other services to poor families. Although many of them were starving, they never stole the milk she placed on the doorsteps of other families. “Did you ask them why they didn’t take it?” Christ asks, though he already knows the answer. They talk about biology, Boston, her father’s army service. The Kazakhstan milk story comes around again.